The flight from Bangkok to Los Angeles (and then on to Kansas City) was smooth, thankfully. 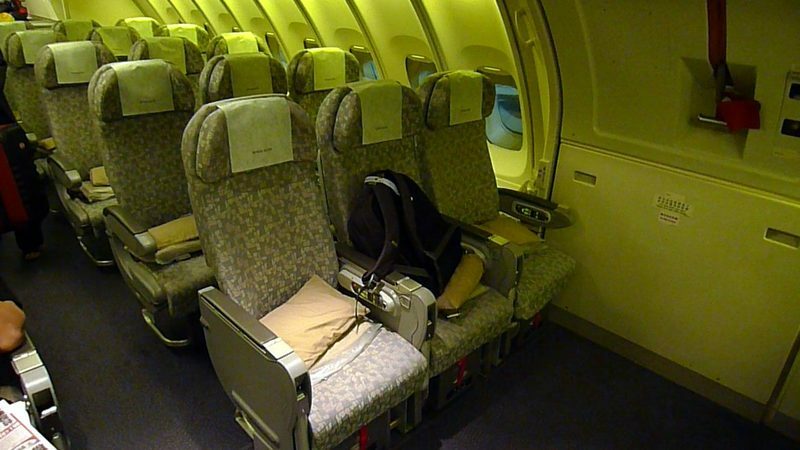 I flew EVA Air, a Taiwanese airline that I fly regularly. Service was good, prices competitive, and the food actually was pretty tasty, too. Since I fly back to the US about twice a year, I qualify for “silver” status in their mileage program. One thing I like about EVA, something that sets it apart from most airlines, is that silver tier status gives you lounge access. When having to show up to the airport so many hours in advance and having long connection times, having access to a lounge is nice. The picture above is the one in Bangkok, which is by far the nicest of the EVA lounges that I’ve seen. 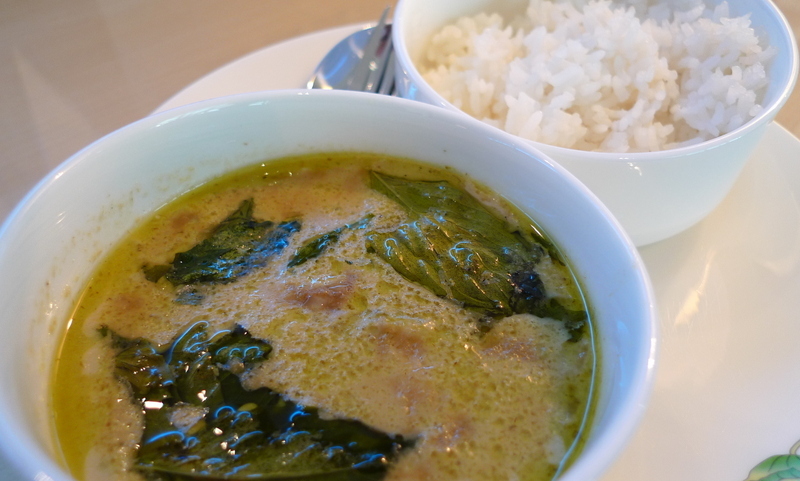 Good selection of food in the lounge, including this gaeng kiaw waan gai – sweet green chicken curry with rice. Really tasty! 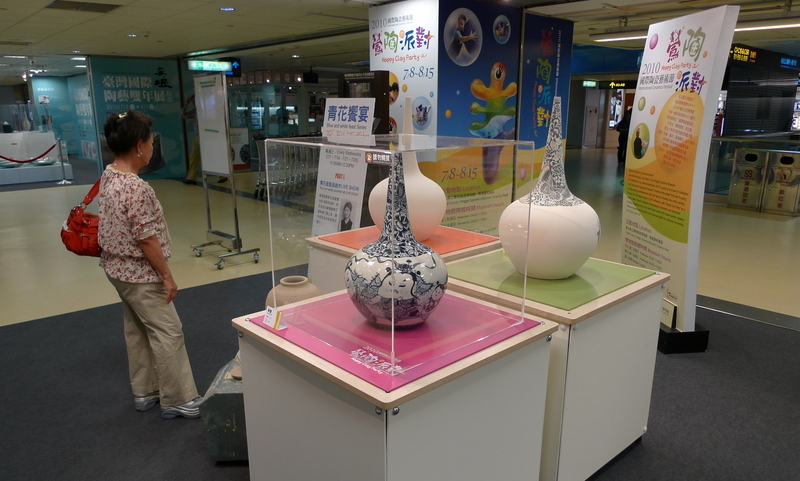 In Taipei I had a four-hour connection and had some time to look at a display they have celebrating Taiwanese ceramic arts. This piece is called Skeletal Bottle, by New Zealander Peter Collis. Beautiful, no? Beautiful serving bowls. Wish I could have bought one. They have three pieces, one unglazed, one with the decoration partially painted, and a finished piece that has been glazed and fired. On my flight from Taipei to Los Angeles I had booked economy class, which on EVA’s 747 includes seating in the upper deck. The seats up here have about 35 inches of pitch, versus 33 inches downstairs. Compare that to 31 inches in economy class on most US and western airlines. I asked for an exit row seat and got the “window” seat right next to the exit door. Great legroom but no window. Plus, there is a little “exit’ sign that was right above the armrest, and kind of restricted where I could put my arm. Probably should have just stuck with the aisle seat I had a few rows forward. Not complaining, though. The seat was pretty comfortable, I was able to sleep about five hours on the eleven hour flight, and the selection of films was good. 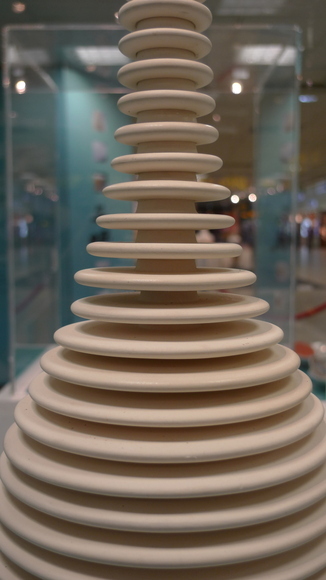 This entry was posted in Uncategorized and tagged Ceramics, EVA, flight, Taipei by christao408. Bookmark the permalink. Ooo, I’m in love with those serving bowls too. They’re really different.I’m glad you had a good and safe flight! ahhh travelling.. that was nice for me even just reading it. Pleased you had a safe and comfortable journey 🙂 Those serving bowls are my favourite of the collection, really original. ‘Silver Status’ eh ? Very nice and that lounge looks lovely. Nice lounge…and they have a full meal for you as well! Wow, that lounge looks very welcoming. My parents fly EVA from time to time, I’ll have to tell them to see if they qualify for that silver status. Those serving bowls are quite unique! Anyways, have yourself a safe and fun trip… as usual! The Skeletal Bottle looks so good! Nice post, Chris! The Skeletal Bottle is indeed eye-cathching.,very unique & artistic. glad you had a good flight. i too try to use the airport lounge whenever it’s available for me and there’s extra time to kill. though i have never been to EVA lounge. from experience, singapore airport by far has the nicest lounges. anyways, love ceramic arts. reminds me of the many hours i spent weekly at a pottery studio back when i used to live in SF. @rudyhou – And for my money, the best lounges I’ve been to were Air Canada’s lounges in Vancouver and Toronto. I’d go to the airport early just to spend some time working there. @christao408 – I think the China Airlines lounge at TPE is nicer than the Eva one. 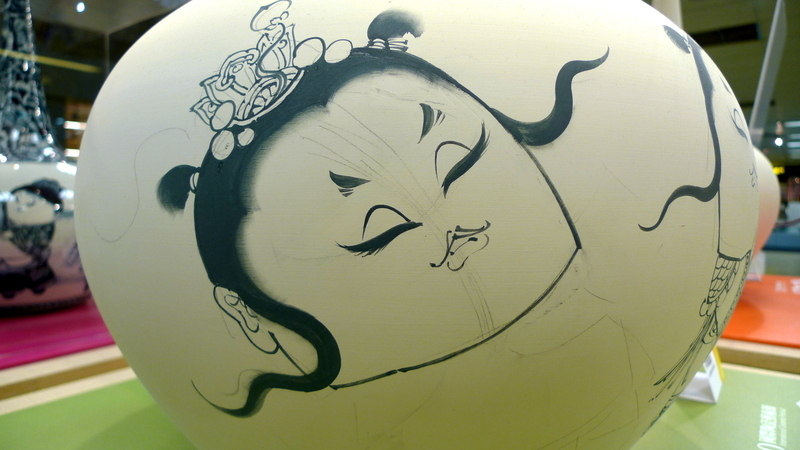 @yang1815 – In TPE, that may be true. Haven’t been to the China Airlines lounge there. But I like this EVA lounge in Bangkok quite a bit. @christao408 – Can you go into the lounge with the deluxe economy tickets? yeah well, kinda an interest of mine. been out of the studio for a while now. not sure how much my hands remembered the pressure and the movements needed to shape the clay. i’d have to get back into it one day. it’s very therapeutic. almost like meditating but with the added back sore for sitting in a humpback position for hours 🙂 i donated my tools to the studio before i left SF. now i wished i didn’t. anyhow, never been to canada. would ove to someday. @yang1815 – Not in an of itself, but if you are a Silver tier or above in their mileage program,. yes. @rudyhou – I would imagine that one’s hands don’t forget how to shape the clay, in the same way your legs don’t forget how to ride a bicycle? well, it’s not that simple. more knowledge on skills needed on this than riding a bike. unlike riding a bike where you are pretty much done in learning process once you know how to ride it, there is a need to get better in throwing when it comes to pottery making. otherwise, it feels like you’re stuck and can’t get anywhere. that is, once you surpassed the initial introductory level of the whole pottery making, which may take months in itself.